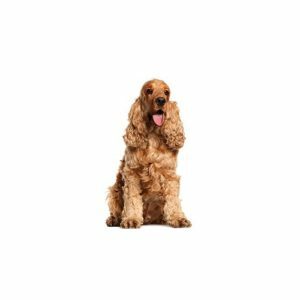 An active sporting dog, the English Cocker Spaniel?۪s compact, solid body practically vibrates with energy and enthusiasm, particularly when at work in the field. Although known for its soft, melting spaniel expression, the breed is a tough worker, capable of covering ground effortlessly and penetrating the densest of cover. His coat can be solid-colored (black, liver or shades of red) or parti-colored, including ticking or roaning. Merry and affectionate, the English Cocker Spaniel is an excellent family companion due to its even disposition and trainability. Whether working in the field or at home lounging on their owner?۪s bed, their tails rarely stop wagging. The breed can live in any environment provided it receives daily exercise. Their medium-long coat does take some care, including brushing and regular stripping or clipping.